Written by Christina Bowman. Media by Taylor Harpster. 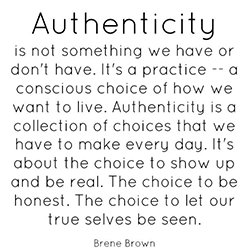 Source: Pinterest A quote from Brene Brown about Authenticity. There is competition for almost anything, and we will often do whatever it takes to win. Competition could be over things such as receiving a new job, being accepted into a school, or trying to get your peers like you so that you make friends. According to Time Magazine, a survey in CareerBuilder of over two-thousand hiring managers claimed that 56% of people applying for positions have lied on their resumes. This means over 50% of people were willing to sacrifice their true selves for the sake of a job. If this is true, then what would make them, or even us, be our true selves for the sake of something that had much less of an impact? 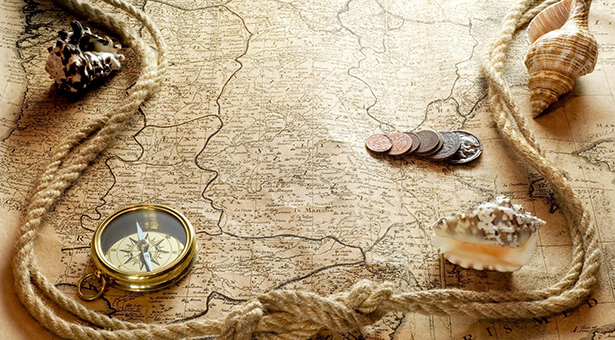 Lying is one example of the crumbling of authenticity, but let’s begin to think of other places this is lost. We know the norms and trends of our society and try to follow them, seeing nothing wrong with whatever they are. These include lifestyle, clothing, hobbies, etc. Often we follow them without giving it a second thought, and maybe that is not always a bad thing to do. However, bad or not, it is still important to recognize that what we let influence us becomes more of who we are every day. Have you ever heard the saying “Show me who your friends are, and I will show you who you are?” The obvious meaning implies that you become who you hang out with. Inevitably, this is true on some scale for everyone, but it may more true for some than for others. There are times I find myself wearing very similar clothing to my current friends that I would not have thought about wearing prior to meeting them. This is a harmless influence, but there will always be the more dangerous ones among friend groups. My dad has always told me it’s easier for someone to bring you down than for you to pull them up. These are simple but true words of wisdom. The people closest to you have the capability to lead you down winding side roads or to walk next to you on the right path. Authenticity is difficult to find in a self-serving world. I often find myself looking for what can I do to make myself look better or what can I say to be more likable. Through our society, our friends, our school, and the world, we have to search for who we are and who we want to become in order to completely fulfill that authenticity. 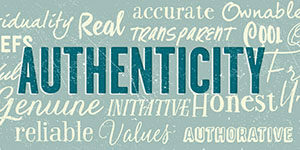 As a Christ follower, the previous three points surrounding authenticity can be applied. Lying is a sin, the influence of society shapes who we become, and the influence of friends can either drag us down or help us toward our goals to be better people. Romans 12:2 says, “Don’t copy the behavior and customs of this world, but let God transform you into a new person by changing the way you think. Then you will learn to know God’s will for you, which is good and pleasing and perfect” (NLT). Next articleWelcome to GU, Students!